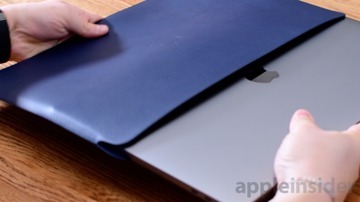 Their first leather sleeve launched for the iPad before coming to the 12-inch Retina MacBook, and now sliding onto the 13-inch and 15-inch MacBook Pros. Just in time for the brand new Pros Apple also just announced. 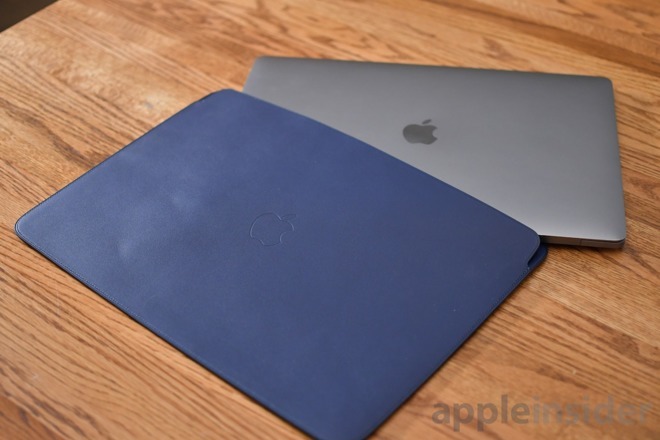 Available in three different colors —Saddle Brown, Midnight Blue, and Black —these genuine leather sleeves carry a high price tag for those looking for cursory protection for their pricey portable Macs. Each sleeve is pretty simple in design, as is the Apple way. 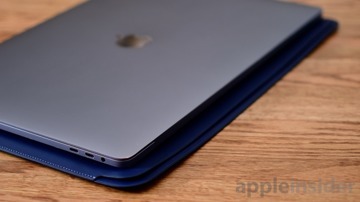 Crafted from European leather to precisely fit over either size of the current MacBook Pros, they have subtle convex dimples on the bottom to align with each of the laptop's feet. 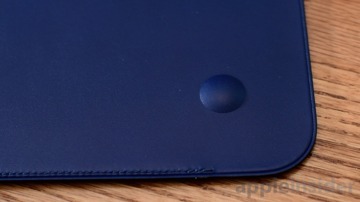 An embossed Apple logo on the top completes the look. The top of the sleeve —that is, where the laptop is inserted —is open a fair amount, making it easy to remove the laptop from its tight fit. Different than on the USB-C MacBook, the one for the Pros does not allow the MacBook to be charged while it is inserted. On the interior is a soft microfiber lining that starts just below the opening. Instead of making the entire interior, the opening on top is leather, since it will susceptible to more wear and tear over the rest of the interior. Everytime the laptop is inserted, it will rub against the top of the sleeve, so having leather right at the opening will help prolong the life of the sleeve. Outside the leather feels very soft, though it is clear there is some sort of protection on it to help prevent the drastic marring un-finished leather is known for. If a drop or two of water hits this, it beads right off, whereas others would soak in and leave a blemish, for better or for worse. One of the charms of using leather is how it develops a great patina over time. This sleeve will do that, it just might take a bit longer to achieve. These newly launched MacBook Pro sleeves are available to fit either the 13-inch or 15-inch MacBook Pro with Thunderbolt 3. The 13-inch will run $179 and the 15-inch will run $199 and are available directly from Apple. If you like the sleeves but have a 12-inch MacBook or iPad, Apple still has you covered. The 12-inch MacBook sleeve runs $149 and the iPad sleeve is $129 and $149 for the 10-inch and 12.9-inch iPad Pros respectively. App Roundup: Astropad, Oilist, Cthulhu Chronicles, Farrago, more!